Often times there are reasons why your leopard gecko won’t breed. One common cause is your female isn’t ovulating. It is very important for new breeders to understand that a female is not going to be receptive unless she is ovulating. No matter how often you attempt to mate, or how often successful copulation occurs. 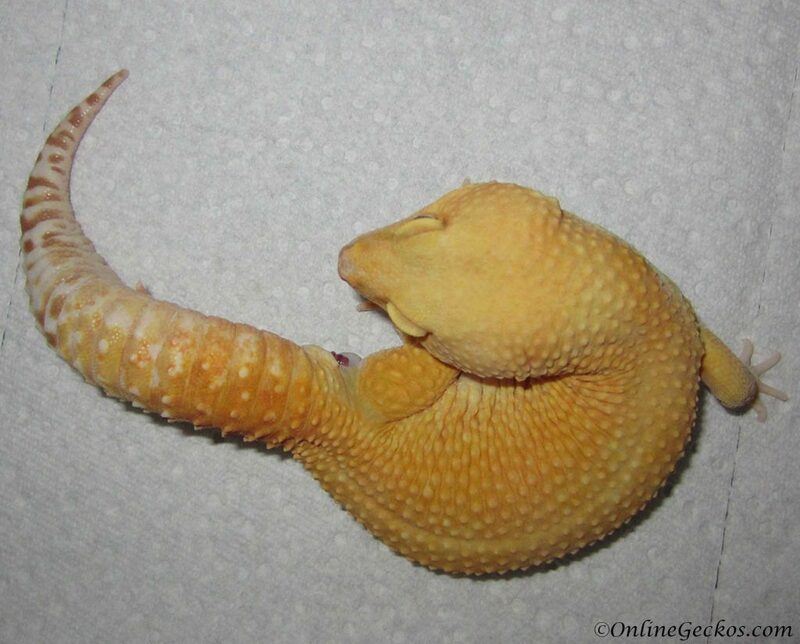 If the female leopard gecko isn’t ovulating, she won’t become gravid, nor will she produce eggs. During the first year, a female will start to ovulate at around 8-12 months old. After the first year, the female will operate on a more seasonal schedule. She will follow the normal leopard gecko breeding cycles which begin around January and last through July. Understanding their cycles will help you spot ovulating females. To spot ovulation, you have to look at the female’s belly. Ovum, female’s reproductive cell, will look like a pink dot. They will usually appear around the female’s stomach (mid-abdomen). Once fertilized, they are usually moved towards the lower right & left of the abdomen where eggs are formed. The eggs will look like elongated spheres, bulging out slightly from her abdomen. See the picture below for an example. Every season we will have a male or two that won’t mate at the beginning of the breeding season. They are completely uninterested even when placed with an ovulating female. There is no explanation as to why this happens, except perhaps they are simply not ready. The best thing to do here is to give the male a rest and try again after some time. You will know a male is interested by their tail shaking behavior. When a male is interested in mating, they will shake their tail tip like a rattlesnake. If this tail shake doesn’t happen, then there’s a good chance mating won’t occur. If a female leopard gecko is egg-bound, or she has other existing health issues, she will likely reject the male’s advances. The female tends to know when she can’t produce eggs. In these instances, it’s better to go along with what the female tells you. If you force it, such as putting in an aggressive male to force copulation, you may end up losing the female before she could produce any eggs. She will likely become egg-bound and die. In general it’s a good idea to separate a pair if the female refuses mating advances and not force it. Timing plays a big part in successful mating courtship. If a male goes in too aggressively and bites the female too hard, the female will instinctively bite back. In these situations the courtship will end before they even start. Sometimes the female will move too much, or turn the wrong way, making it difficult for the male to copulate. If it takes too long for the male to copulate, the female may get frustrated and starts to move even more. She will eventually shake her tail and bite back to stop the courtship. If your female is too far along in ovulation cycles, or she starts to produce infertile eggs, there’s a high chance she will refuse the male’s courtship. In our experiences, when a female is gravid (fertile or infertile), she will aggressively fight off male advances. It’s common for the female to not want to mate at all once the eggs start developing inside her. This also comes down to timing, as you don’t want to introduce a pair too late or you may have to wait until the next year to try it again. Leopard geckos are live animals and they have a mind of their own. While some things you can control such as spotting female ovulation, most of what happens during breeding courtship are out of your control. The best you can do is to be patient, separate the pair when they need to be separated, and keep trying. What inspired me to post this article is a TV series called The Zoo on Animal Planet. I watched season 2, episode 2 “The Tiger’s Dance” over the weekend. I had a real chuckle watching them try to breed two tigers. You can watch the episode in full here. Fast forward to 21:40 and 33:10 if you’d like to see just the tigers mating. 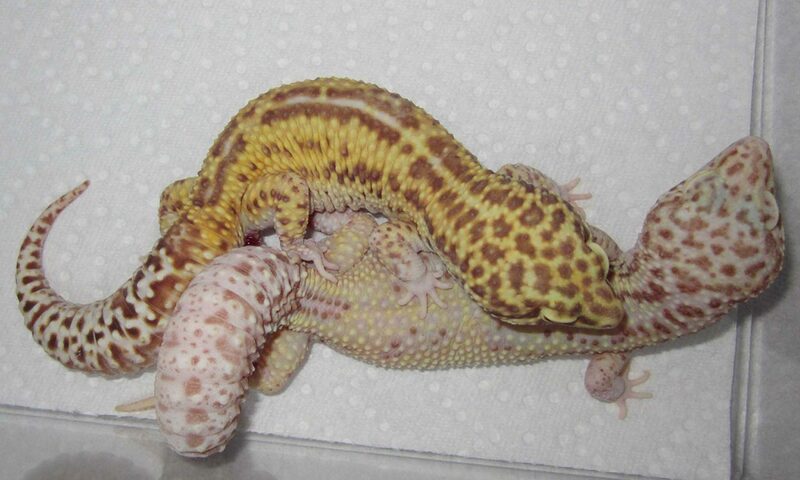 The way the tigers breeding sessions unfolded remind me a lot of leopard gecko breeding. You can see the frustrations and concerns the zookeepers felt. They really couldn’t do much except to separate them and retry again over and over. The female tiger was moving too much, the male wasn’t mounting correctly. The male tiger biting the female too hard at times, causing the female to claw, which in turn scares the male off. All these things can happen when you try to breed two leopard geckos. Like the Curator said, when breeding animals, you really can use some luck. There are some tricks we’ve learned that may help you achieve successful copulation. When you have a female leopard gecko not receptive even though she is ovulating, you could try placing the male’s scent in her tank. Take a piece of paper towel from the male’s enclosure, such as the paper towel he has been laying on in the moist hide. Then place that paper towel inside the female’s tank, and leave it in there for a few days or a week. The idea is to get the female used to the male’s scent. So hopefully when you introduce the two, the female will be more receptive of the male. If you have a male that won’t breed, try placing the female in the male’s tank, instead of the other way around. We’ve found that since males are very territorial, sometimes they get distracted due to being in unfamiliar surroundings without their scent. 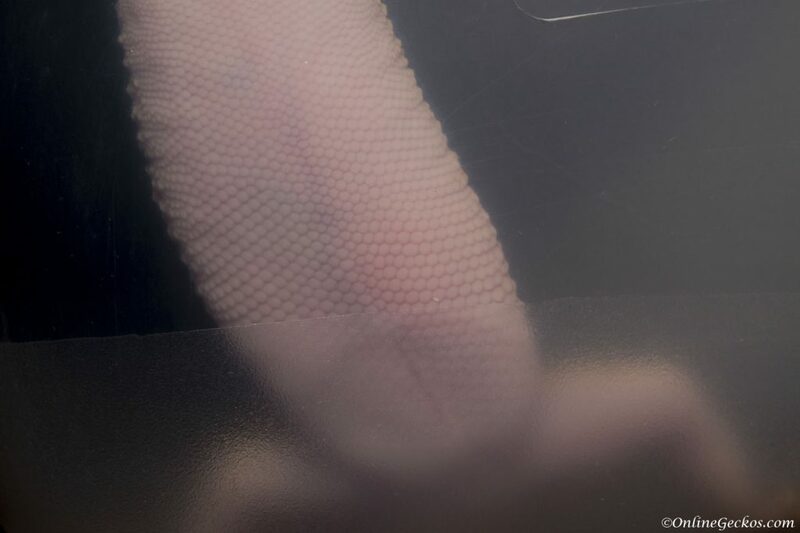 When placing the geckos together to breed, try to allow them to see each other right away. Don’t place the male right behind a female, because the male will likely bite the female’s tail before the female even sees him. This can spook the female and cause the female to bite back. If your male has difficulties copulating, even though he’s fully interested in mating, try placing the pair inside a smaller container. We’ve found that when there is less room to move, it works out better for the male. Some males can take a long time to copulate, so long that the female may become annoyed and end the courtship prematurely. We have a separate critter keeper container for when a male can use a bit of help. Do consider giving your female a break if she laid a large amount of eggs a season prior. Most females recover quite well over the Summer/Fall. They will feast, plump up, and get themselves ready for another breeding season in January/February. But sometimes you may have a female that does not recover fully. Maybe her tail isn’t as plump, or she appears thinner than the previous season. Maybe it’s just her demeanor, she’s less active than before. If you have a female that exhibit the above conditions while also refusing to mate, then the gecko may be telling you something. In these cases, you may want to consider letting the female rest for a season so she can regain her health and strength. Skipping a season isn’t unusual for gecko breeders if they spot a female that can use extra time off. If you’ve tried everything and your leopard gecko still won’t breed, then you have the choice of either wait for next year to try again, or sell the gecko as pet gecko. We have seen a female that refused to breed for 2 seasons in a row, only to be receptive on the 3rd season and produced fertile eggs. If you have a gecko worth waiting for, then it may be worth it to keep trying. On the other hand, we have also seen females breed for 1 season, then refuse to breed thereafter. 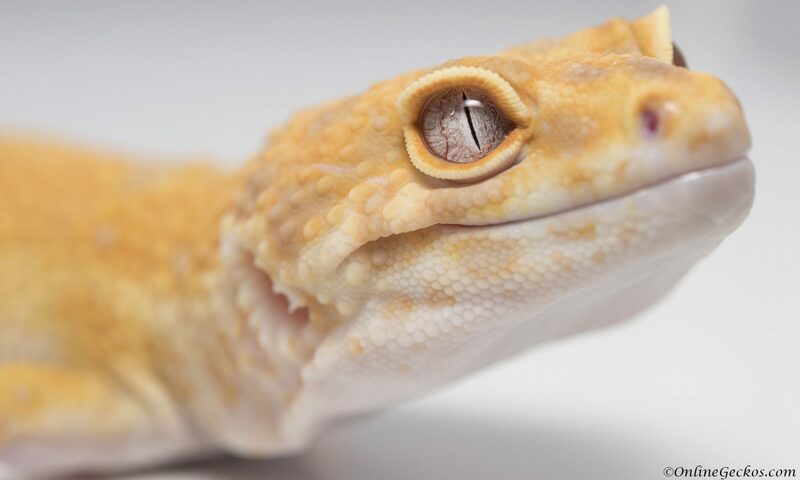 Breeding leopard geckos (or live animals in general) require patience and luck. You can’t always explain why they behave the way they do. It’s important to not be upset at breeders you purchased your geckos from. No breeder can guarantee the fertility of geckos they sell. You take a small amount of risk when purchasing geckos to breed. And you learn to accept that sometimes things just don’t work out. In general leopard geckos are prolific breeders. You shouldn’t bump into too many problems getting a pair of geckos to breed and copulate. However when you do experience mating issues, they often happen to your most precious pair…such as your most expensive pair, or a project that you have been really looking forward to. Mother Nature has a strange sense of humor sometimes. We hope this article is helpful to you. Be sure to read our guide to small scale leopard gecko breeding, as well as leopard gecko breeding season 2018 for more in-depth discussions on leopard gecko breeding. Good luck with your leopard gecko breeding projects!